It was back in September when I came home one night and there was no parking on our street. The new neighbors were having a party. Cars on the lawn and everywhere and the front yard full of drinking, cussing people. This, after a summer of each night of a loud porch party. One evening as I was checking the mail the conversation was about which bong was the best. They are nice people, but we always had a quiet tree-lined street. Now that the housing market had taken a deep plunge in our area, we had investors buying rental properties and our neighborhood isn’t what it used to be. Coupled with a subsidized apartment building that had just been built less than a half-mile away and the increase of homeless traffic on the rail trail that runs the exterior path of our housing development and the neighborhood had changed drastically. My husband came home one night to find a man in a ski mask walking the neighborhood. Two of my neighbors were moving, one right next door, who would my new neighbors be? I knew our home had lost value but I just kind of buried my head in the sand about it. Then I talked to an accountant that said my home had lost so much value that it would take about 30 years for me to recover my investment. Couple that with a friend who asked an innocent question, “At what point do you cut your losses?” We realized it was time to make decisions. I called the bank about a modification on the loan because at this point I can buy my exact floor plan for $90k less than what I owe. The bank said if we were current on the loan, a modification was not possible. So we missed a payment and asked for a modification. They said we didn’t qualify for a modification but we qualified for a repayment plan. It seems you have to miss two payments to be considered for a modification. So we missed a second one. They asked us to turn in our financials, which we did. Only here is where it gets confusing or so I thought. My loan is with Wells Fargo Bank. They require that a home preservation specialist signs off on your docs to begin the process of a modification request. Only no one will sign off on my docs. They agree that I have turned them in, they agree that Wells Fargo has them, only they say that I need to get “serious” about my request and get someone to sign off. Besides calling and leaving messages, putting everything in writing and calling HUD how am I not being serious? Almost two weeks have passed since they promised a sign off on my docs. In the meantime, they send me letters that states, “We are sorry we have not come to terms.” Here’s the kicker. If we start making our payments, then we no longer qualify for a modification request. I am frustrated and confused. Then it dawned on me! We, the taxpayers, have already paid for my house. We did so with a bailout. They don’t care if I foreclose because they’ve already been paid. They sell the house to an investor and move on making money from what I paid, making money from the bailout, and making money from the investor. I knew the American public had been scammed but I didn’t realize to the extent. It was kind of weird when I first heard of the bailout being bandied about in Congress. I realized right away that the very people who caused the mess in the first place knowingly giving bad loans were going to be rescued in a way that no one in their right mind would do for anyone else. The more I heard about it, the more suspicious I became. I don’t own a house nor have I ever, but I am seeing people with really good paying jobs being hounded by banks because their house is devalued and their loan is way over priced. The banks should adjust the loan to reflect the price of the house, but of course they won’t. They want “their” money even though the loan is simply an estimate made by an adjuster who did it during the inflation. But they don’t care. The bottom line is those who have money make sure they put rules in place to ensure they don’t lose it. Those who work for them will be screwed one way or another. It doesn’t take a rocket scientist to figure out that many who paid all their lives in preparation for their retirement will be destitute when they arrive at the age for it. The veneer of righteousness has disappeared from the public marketplace. I went through the very same process a couple of years ago, and no one could help us with coming to an agreement. My daddy put in $130K as down, with monthly payments of $5k (w/o tx & Ins)…the bank resold the property for less than a third of our original note and kept our investment! 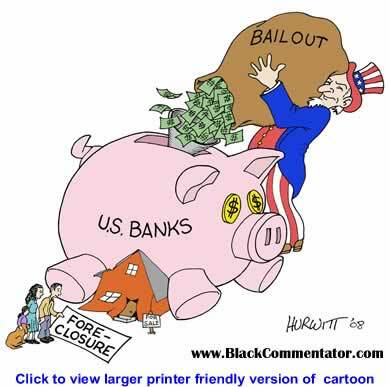 Grrrrrr…bailout!